In the two years since I was diagnosed with stage IV melanoma, my healing journey has been spurred on by the love and support extended from family, friends and even strangers around the world, particularly in the Kansas City area. 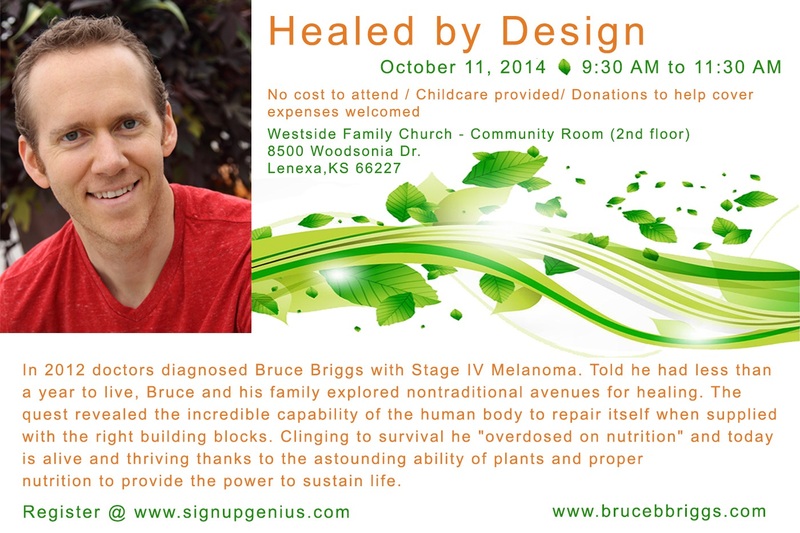 As a way to express gratitude, I will be hosting a seminar in Kansas City to share my journey beginning with the diagnosis and discussing the nutritional protocols used to heal and how others can rebuild health and prevent disease. The event will take place Saturday, October 11th from 9:30 to 11:30 in the morning. Westside Family Church (8500 Woodsonia Dr. Lenexa, KS 66227) has graciously allowed us use of their facilities and childcare will be available. There will not be a cost for the event, however, if you’d like to bring a donation to help cover expenses we would be grateful. · Please use the link below to register for the event by Monday October 6th so we are able to plan accordingly. · To provide an accurate count, please sign up each attendee individually. · Leave a comment if you will take advantage of the childcare, how many children and their ages. This event is open to anyone who has interest, so please feel free to forward this invitation.